There’s no better time to start making your vision a reality, than before New Year comes. Twelve months are waiting for you to reap the benefits of making your dream their dream and success. Women’s success. 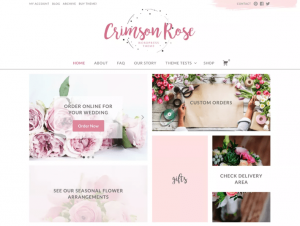 To start from the beginning and set your feminine website/blog on its way to excellence, you need a feminine WordPress theme. The most recommending figure that indicates a WordPress theme is worth your consideration refers to the active user base, that is the total number of active installs. The date when the latest update was made shows how frequently the theme is upgraded to current quality and security standards. Last, but not least, the number of 5-star ratings and reviews themselves are good proof that you should choose, or not, a certain theme. Mesmerize (we say it by the numbers) ranks on top, scoring the most points for all of the 3 above-mentioned criteria. Mesmerize is best for visually-focused content, adequate for imagery customization and a brandable theme, unquestionably. In a coding-free live Customizer, there’s a list of pre-defined sections you can match for a perfectly refined fashion blog or e-store. The hero content can be customized to the smallest bit, if you want to drive your blog/site towards a specific area of interest. You can set featured content (image) for every blog post, to give an unmistakable degree of uniqueness to your opinions exposed in the articles. You can set sticky menus for practical purposes, letting users navigate at ease within the website content, with an already clear content structure brought to their attention. A simple slider integration can get your website/blog out of commonplace design and make it step into the limelight. A fancy photo gallery (with zoom-in/out, fade-in/out effects) will give force of expression to a website that’s made to shine. 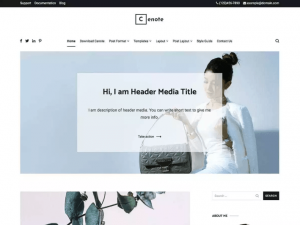 For better inspiration, the theme comes with some demos (fashion, yoga, interior design) that’ll help build a new website from rock-solid design principles. The Ashe Theme is good for novices in web design, new blog/site starters that don’t want to bother with any site building complexities. The starting points for setting a new website on track are the predefined styles (variations for custom niches), the documentation with helpful info and the video tutorials. The Customizer provides options in a list that’s full of suggestive categories names, each taking you to a specific subset of customization options. These options range from branding to optimized functionality to specific elements bearing the imprint of uniqueness. You can switch from the default, classic and simple layout to a different layout you define by using the parameters in the Customizer (specific header width, a certain content width and the values of your choice for footer width). The Featured Links functionality is specific to the Ashe Theme, letting you take website customization to another level. The preloader feature gives to a website’s stylish look the completeness of details it needs for perfection. There’s another specific feature that makes Ashe a good choice: the featured slider allows for complex, yet easy to set customizations for every post on the blog. The theme is translation-ready, making it easy to spread the message to a worldwide audience. Accelerate is a good theme for simple designs and complex content. Simplicity is its strength. It’s easy to give a fairly neat design to whatever blog/website topic. Provided that Accelerate remains a feminine theme. The Customizer menu has clear categories, the classic ones (for site identity or homepage settings) and some categories that bring the force of simplicity to its full value. The Colors option allows for selecting a background color that’ll be applied to the website/blog. It needs careful consideration, as there’s no additional color that competes with it for attention. The Background Image option replicates the above, for images. By uploading an image in this section, you empower that image with the force of a thousand words. Inserting media into the header is placing your website one step further into the future. As it focuses the design on visuals, motion and words, all in one nice, attention-capturing effect. The slider functionality keeps the theme up with modern design standards. All in all, the theme is especially made to accelerate the design process and undergo any changes needed to keep the website neat and modern. 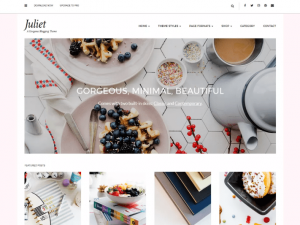 This theme is intended for women whose hobby is photography. It’s a theme that caters to a specific niche, and it ensures all conditions are met for everyone needing to make up their own Fotografie. As is obvious for photography, the design should focus most on visual appearance. Fotografie is an inspired choice to make a stylish and professional website. You’ll be able to showcase photos and let them speak by themselves, within a design frame that bears the signature of elegance. Fotografie is specially designed for blogging. Many features cover usability for blogs and the way web surfers navigate within blog pages. The theme has a bundle of specific options belonging to this particular photography-focused template: breadcrumbs and excerpts settings are pretty useful for photography blogs; setting specific hero content for the homepage or the entire website helps to build a photographer brand; a special option enables you to display only some blog post categories on the front page, if you want to – the homepage will be formed only of the content you want to put forward. Additionally, Fotografie lets you set up featured content (for the homepage or the entire blog) and professionally bring your best work to front. The theme is also easy to modify, due to the nice feature to Reset all settings to the defaults, which simplifies the redesign process. As the header is the first element people will see in a website, it needs to be perfected to the smallest detail. That’s why Cenote introduced different layouts for the header. Moreover, you can add a top bar area with useful information that will be saliently displayed on the website. For ease of navigation, a search icon can be added to the header of your website. Cenote allows for inclusion of a post slider, enabling a dynamic succession of blog posts or categories in your website/blog pages. What makes Cenote unique is the possibility of adapting the theme to pretty any kind of niche that’s of interest to women. Cenote makes available different layouts for: the site, the blog, a page or a post. Hence, you’ll have a customized layout for any type of content you want to present to your users. To complete the website/blog design, some further customizations for the footer are available. You only have to choose its layout and decide whether navigation back to top should be activated. If you’re in the mood of developing a journalist style, AccessPress Mag is for you. It’s a theme that works well for newspapers, editorial content or online magazines. 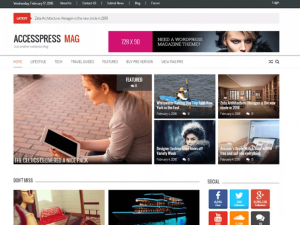 It can also be customized for any blog or personal website you want to build. The theme is well documented, so you can develop your website/blog step by step, by following the instructions. Its layout is perfect for bringing important content pieces to users’ attention, using imagery and text. AccessPress Mag lets you integrate social media links, which will help spreading the word about the articles you write. This is especially important for a newspaper or for editorial content that needs a wider reach for building an audience. Concerning site identity, Crimson Rose allows for simple integration of a retina-ready logo. This makes your branding efforts more effective and takes site identity customizations to another level. For a more visually-focused website, Crimson Rose offers the option to integrate an Instagram gallery, through a widgets section. The advanced options for blog display give you the chance to choose among several variants of how posts will be displayed in the main page. The blog display feature allows you to display a lead excerpt + grid, simple grid, only excerpts or full content. Moreover, you can customize the 404-error page to your liking. This is important for SEO and usability purposes, making it simpler for users to navigate back to your online content, in case they land on a 404 page. For further font customizations (available in the free version of the theme), you need to install the Designer Fonts plugin. For tweaks and refines to the design of the website/blog, you have multiple options regarding the colors scheme. You can apply the colors of your choice to important elements such as archive, footer, links and links on hover, all matching a primary color that defines the overall aspect of the pages. Choose between two different skins: a classic feminine look and a more modern, simpler look. The latter is available in an alternation of black and white, for the free version. What’s more interesting is that, for each post you set as sticky on the blog, you can include an image like a signature. Authorship is now part of the design, another means to express your unique style in a fashionable way. On the homepage, you have specific settings for a banner you want to display. Still on the front page, you can choose to display a series of featured posts. 4 articles you want to promote will find their place in the section of featured posts, right on the first page of the website/blog. To show users that you are constantly writing on the blog and always have fresh content for them, you can choose to display a sidebar with the blog feed directly on the homepage. Many options for widgets areas give you the possibility to customize the website/blog in every detail. 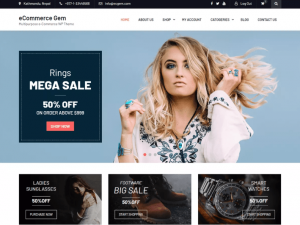 eCommerce Gem is a theme that’s perfectly designed for online stores. As a result, the theme integrates WooCommerce, making the process of setting up all the elements for online shopping as simple as that. In the same line with WooCommerce integration, eCommerce Gem offers additional options for better e-store usability: in the Customizer, you can easily set up breadcrumbs, that’ll help visitors get oriented into the website and smoothly navigate within categories, subcategories and product pages. To make the online store stand out, you can choose to display a featured slider, and further customize it to your liking. Choose one of the available transition effects and make a stylish presentation of this featured content elements. The theme is well documented, helping you make a better use of the available options and customize the website exactly as you want. 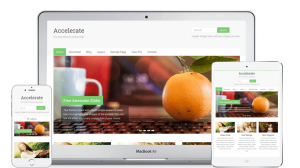 This theme is specially designed for food blogs. It provides a layout that’s perfectly adapted to frequently posting recipes and featuring content you want to display more prominently on the blog pages. 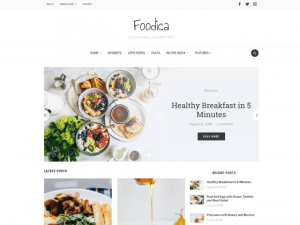 What’s special to Foodica is the recipe index the PRO version offers to you. To easily spread the word about your posts, and to help create a solid community around your blog, you can use the header social icons widget. It can be adjusted in the live Customizer, in no time. Also, Foodica suggests up to 10 color schemes that’ll give your blog that touch of uniqueness it needs to become memorable. We hope this top 10 list gave you a good start for building your new website/blog. Depending on the niche you want to tackle, you can choose one of the above and test multiple design options. Or else, you can choose one of the above-mentioned multipurpose themes and play with their different features, until carefully customized elements will give the appearance of an excellent design.